"We’ve had a wine shop here since the early 1980s, ever since customers used to knock on the door of our cellars asking to buy cases of wine. For a long time a hidden secret we’ve opened up the front to Greenwich High Road and offer more than 400 wines by the bottle and case, including rare vintages going back several decades. We hold regular wine tastings in our shop and wine bar just next door exploring varied wine regions and grape varieties plus you can always try a selection of wines from our enomatic machines." 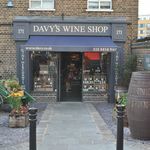 What did you think of Davy's Wine Shop?